A widely used probiotic stimulates bone formation in mice, and could feasibly represent a new approach to preventing or treating osteoporosis in human patients, according to research by Emory University researchers. Studies by Roberto Pacifici, Ph.D., and colleagues showed that in young, healthy female mice, treatment using Latobacillus rhamnosus GG (LGG) prompted other intestinal bacteria to produce the short chain fatty acid (SCFA) butyrate, triggering the expansion and activation of T cells in the bone marrow, and ultimately stimulating Wnt signalling in osteoblasts, and bone formation. Fractures due to osteoporosis can have serious consequences, with hip fracture complications leading to mortality rates of up to 24–30% in the first year following injury, and a 50% rate of permanent disability, the authors write. However, the costs and side effects of existing drugs that are used to treat osteoporosis mean that most cases are either poorly treated, or remain untreated. Nutritional supplementation with probiotics represents an alternative potential strategy, and small-scale human studies have reported positive results with the use of probiotics to supplement the diets of osteoporosis patients. Despite these small studies, however, it is not really understood whether probiotics can improve postnatal skeletal development. The team’s previous studies had suggested that LGG supplementation could protect against bone resorption and bone loss in mice, and in certain cases drive bone formation and increase bone volume. 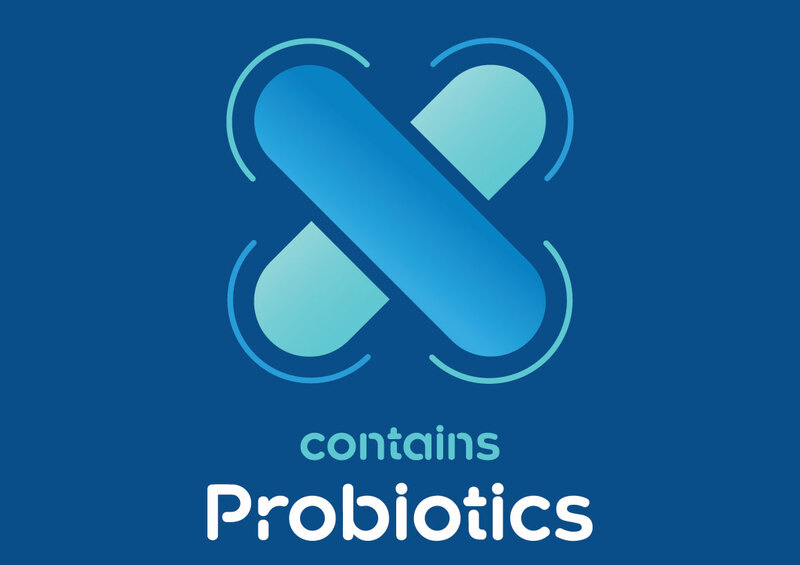 Lactobacillus is among the most common of bacteria that are thought to have probiotic effects. Independent research has also separately indicated that LGG prompts the expansion of different types of intestinal bacteria that produce the short-chain fatty acid (SCFA) butyrate. SCFAs are known to support the development of peripheral regulatory T cells (Tregs), while studies have reported that Tregs play a role in stimulating bone formation. For their latest work, the Emory University researchers investigated the effects of supplementing diet using LGG on bone homeostasis in young, healthy female mice. They found that adding the oral probiotic to the animals’ normal diet led to increased intestinal and serum butyrate levels, as well as increased bone formation. In these healthy animals LGG supplementation acted to stimulate the growth of other butyrate-producing gut bacteria, including Clostridia, which are recognized as the “central generators of butyrate in the intestine,” the authors state. The same effects on bone formation could be achieved by treatment using butyrate itself. And while butyrate treatment also led to increased bone mass in mice that were raised in a germ-free environment and so had no intact microbiome, LGG supplementation was ineffective in these animals. This supported the idea that the probiotic exerts its effects through the metabolic activity of other microbes that normally inhabit the intestines. “These findings indicated that a key mechanism whereby LGG-induced bone anabolism is by indirectly increasing production of butyrate in the small intestine,” the authors commented. Further studies in experimental mouse models and in cultured cells demonstrated that supplementation using either LGG or butyrate induced the expansion of Tregs in the intestine and in the bone marrow. 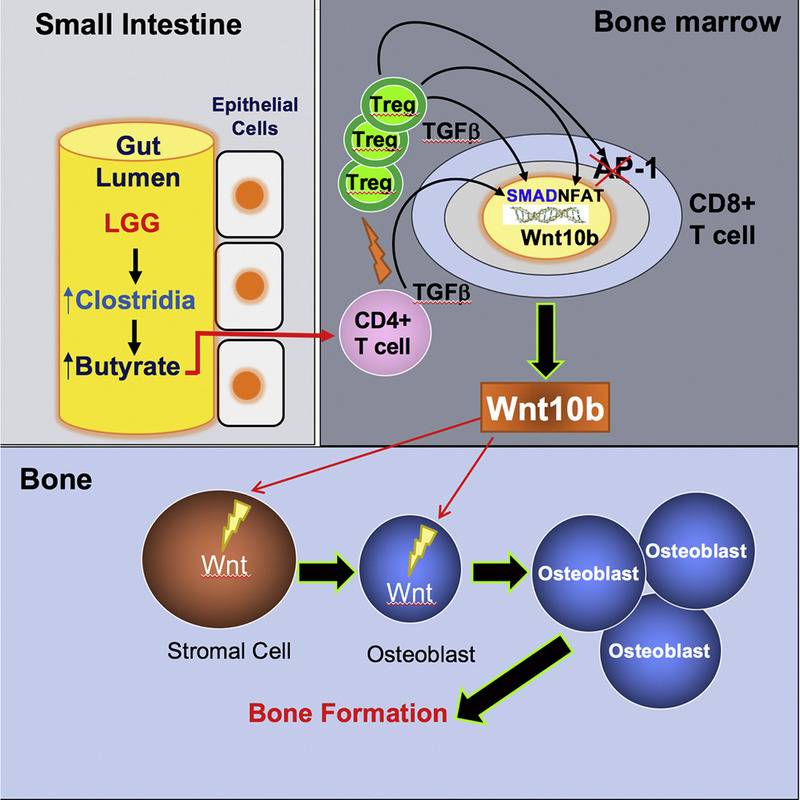 Treg expansion stimulated bone marrow CD8+ T cells to increase secretion of the Wnt ligand Wnt10b, which then activated Wnt signaling in the osteoblasts, stimulating bone formation. The bone-boosting effects of LGG or butyrate could be inhibited using antibodies that specifically blocked Treg expansion.